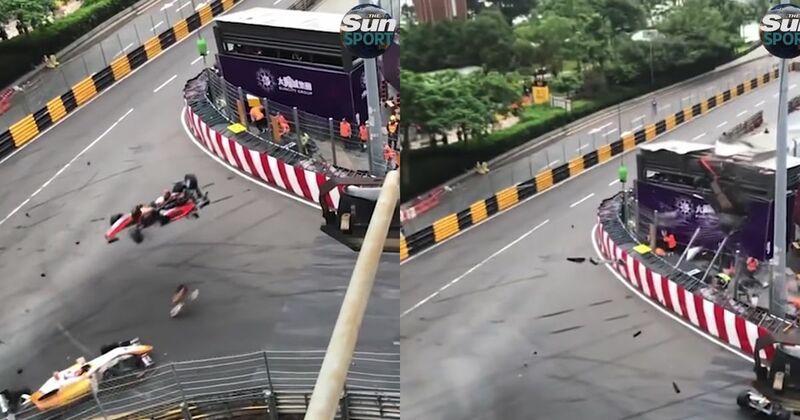 A driver has been left needing spinal surgery and four others have been hospitalised after a shocking crash at the Macau Formula 3 race. As the train of cars approached a 90-degree right-hander on lap four of the street circuit, which is almost fully bordered by metal barriers, Sophia Florsch’s number 25 Van Amersfoort Racing car reportedly had contact with another, causing Florsch to lose control and spin just before the braking zone. Some reports suggest that the car in front of Florsch braked extremely early. Unable to slow down and facing the wrong way, the car became a missile hurtling across the turning cars ahead of it. But before ploughing into too many of them, Florsch’s car hit the kerb on the inside of the corner and launched into the air like a missile. It then clipped the top of another car, flew over the safety barrier and slammed into a marshal’s post on the outside of the bend. Hard. The impact crushed the rear and top of the car, putting huge pressure down the helpless Florsch’s spine. Spinal fractures have been reported by various outlets, with the young driver being sent for surgery this morning. She was conscious and responsive after the crash, thankfully, and more recently tweeted a message of thanks to all the medical staff who helped her. The shocking collision sent bits of carbonfibre and fencing flying into the busy corner, too. Two photographers were hurt; one with a concussion and another with a laceration to his liver. Ouch. Unlucky marshal Chan Cha In suffered deep facial cuts, a broken jaw and a stomach wound. Japan’s number 31 driver Sho Tsuboi was also taken to hospital after getting caught up in the terrible collision. The race was quickly red-flagged – for the second time. Earlier in the race a multi-car pile-up on the narrow circuit had caused a full stoppage while cars and debris were cleared away. Recommended car throttle shop Worldwide Shipping In The CT Shop Car Throttle Submit Your Videos To Get Featured On Our Social Channels Motorsport Raikkonen’s Five Year Win Gap Isn’t F1’s Longest WTF1 Come And Race With Us In The WTF1 Virtual GP Motorsport This Alfa Sprint's Boxer Engine Revs To 9500RPM And It Sounds Immense Motorsport Driver's Face Used For Nascar Team's Freaky Livery Motorsport An 18-Year-Old Just Won An IndyCar Race Motorsport F3 Racer In Macau Horror Crash ‘Will Race Again’ After 11-Hour Surgery Motorsport Porsche Is Going Back To Rallying With The Cayman GT4 Clubsport WTF1 Is It Time You Revisited Grass Roots Motorsport?